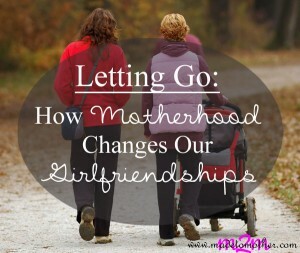 You know those friendships, the ones you had before the kids came along, that just don’t seem to work anymore? Maybe they’re not parents yet and don’t understand how your life has changed. Or perhaps they are mothers too, but your parenting styles are WAY different. Or maybe you just don’t have the time or energy to see and speak with the old groups you used to hang out with. No matter what the reason for some of your friendships not being what they used to, motherhood changes us. We all know it. And sometimes people just drift apart. Like when you graduated high school, finished college, moved away or got married; some friendships just didn’t last. You changed, circumstances were different and the relationship just couldn’t morph and navigate around it. …Finish reading over at the Portland Moms Blog! It’s true! If people just accept it and play nice, we’ll all get through it.